Publisher Storm / The Sales Curve Ltd.
8.08 points at 26 votes (rank 70). The storyline: The siblings Tam and Rit live in an elf village. They lead a happy live there with lots of sweet cake and endless parties. One morning they realize that something terrible has happened to their cohabitants over night. The village inhabitants have turned to evil, captured their mother and locked her in the Maboots Tower. Fortunately Tam and Rit have inherited the Wand of Sheesanomo from the eldest of the village and they have been given the Rainbow Shoes by their father. Armed with these two things they can mount the tower to free their mother. But they have to hit furry creatures on the head with their wand and climb on ladders which can be reached with the help of their Rainbow Shoes. This is not easy at all when the former friends have some really mean surprises in store! The game: The game consists of 32 levels and some additional bonus levels. The task is to collect flowers and to either nudge the evil creatures or throw them to and fro with the magical wand until you can pick up a useful weapon. Touching an opponent leads to death. Single platforms can be reached by ladders, jumping or sometimes by climbing a balloon. There is also the possibility to build own ladders, whereas the self-built ladder disappears when a new ladder is built. If you don't defeat the opponents of a level in a certain time, the game automatically switches into a "mean mode" and everything gets more difficult. A level is finished when either all opponents are destroyed or all the flowers are collected. In the latter case you enter an "EXTRA GAME". All the remaining opponents transform, and with their destruction one of the letters "E", "X", "T", "R" or "A" is released. The letter changes and fully disappers after some time. By cleverly collecting the letters you can combine the word "EXTRA". If you have completely collected the word during the game, you will get awarded an extra life from am elf. So on the one hand you should aim to kill as many opponents as possbile through the normal game, but on the other hand keep some of them alive to be able to collect as many letters as possible in the EXTRA GAME. After level 8 you get into the first bonus level. If you are successful in a bonus level you receive 10000 bonus points each. In the first bonus level you fight against six crocodiles. If you hit a crocodile often enough with the wand, it will disappear. The difficult thing is, that these crocodiles spit out little baby crocodiles, which kill you as soon as you touch them. For this reason it is recommended to keep enough distance from the crocodiles. Not to be attacked from both sides for a long time, it is wise to first kill the crocodiles on one side and then on the other. If you play with two players, it would be best to use one player for each side. You are safest on the lowest plane. There is no need to climb up the ladders, the crocodiles will come down by themselves. This bonus level follows level 16. Here you fight against a whale, from whose blowhole small whales are ejected. The eye of the whale is the soft spot and can be best reached by a ladder. This also brings the advantage that you are quite safe from the baby whales, because they don't climb the ladder. To defeat the whale it has to be hit 20 times. A finished bonus level is always rewarded with a small firework. The third bonus level follows level 24. An elephant sits on a trapeze that moves it up and down as well as left an right. In line with the crocodiles and the whale small beings emerge from the elephant's trunk. The elephant is defeated after 30 hits. In the game all characters are animated and thus more recognizable. Spuds They have the mean habit to duplicate themselves. The more you kill, the more they duplicate. Avoid to use of bonus weapons to keep their number low. It is best to let them live until you have picked all the flowers, to collect as many EXTRA letters as possible. Sharks Do not let yourself be fooled by the tears! The touching of tears leads to death. Wasps When you see them you'd better make a bolt for it or you kill them as quickly as possible. They are the only creatures able to fly. Nessies They constantly have a ravenous appetite. If you are on the same plane, they will go after you. Polymorphs Contain a hidden surprise. Like the Nessies, they can only see you if you are on the same plane. In case of an attack, just build a ladder and take flight. Bushies These are just furry fakes (phoneys). The are relatively slow and easy to hunt down. Bunnies When they grasp a carrot, it is time to run away, because then they whiz over the screen. Starfish They have their own version of an Australian hobby. Be aware of their boomerang. Blue Meanies They name already implies it! They only appear, when you need too much time for a level. When one of the evil creatures is killed by the magic rod, there appears a weapon at its place. The weapon is activated through a touch by the peg. Balls These 4 balls move similar to balls on a billiard table over the whole screen and explode after some time. If they touch one of the creatures, it turns into a fruit. Picking up the fruit will be rewarded depending on the type with 1000 (strawberry), 2000 or 3000 points. Rocket The rocket is fired horizontally in the running direction and destroys the creatures which are in the fireline. Dynamite The dynamite works horizontally in both directions. Bomb The bomb destroys everything in the immediate surroundings. Further weapons are "Super" (a diamond-shaped letter), "Ice" (ice crystals) and "Flame" (a fire flinger). Graphics: Every individual level is limited to one screen. While the original machine game and other portings feature nice and detailled background graphics, this version has only a black background. This tends to make the game action clearer and above all very quick. The single characters are designed with great detail in shape and colour and are mainly alive through the successful animation. 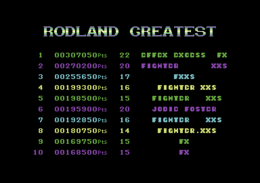 On the upper edge of the screen both players' score, the number of lifes left and the level (scene) is displayed. You can also see the letters of the word "EXTRA" you already collected. Sound: The game has a well-fitting, almost sticky tune-like title song. During the game itself no music is heard, but the single activities are sufficiently and differentially set to music. In some later levels there are several doors, which you can go through by pressing the joystick upwards. You come out of another door but watch out, you never know which one it will be! If you jump down from a ladder or a platform you can move the peg with the joystick to the left or right while flying. If you hold an enemy with the wand, you can throw it to and fro with the fire button. By pressing the H button, the game is paused and continued. Using the RUN/STOP button ends the game. How you solve the game, can mainly be learned from the description of the game. When you play the game alone and you want to get as far as possible, you can use a small trick. Shortly before you get killed with the last life, you can just continue playing with player 2. For this you only have to press the fire button of the other joystick. 1. If you enter "ONLY JOKING!" into the highscore, the entry changes to "OR AM I?" and you get unlimited lifes. At the same time the saving of any highscore will be disabled. 2. Entering "PAUL ROGERS" changes to "BART SIMPSON", but has no other effect. To change certain settings the version of REMEMBER (Release 329) or the one from LEGEND/NEI is recommended. Here different trainer modes are adjustable. In this version by Remember different mistakes were corrected. When you have played the game until the end or you die fighting the boss enemy, the highscore table shows now the right level number 32, instead of 31. You could get touched by the first boss enemy before it appeared on the screen. Also the second boss enemy was counted as touched before it appeared on the screen, when you had touched the disappearing (flashing) first boss enemy. If you finished the game, you could only switch the C64 off after the final sequence. 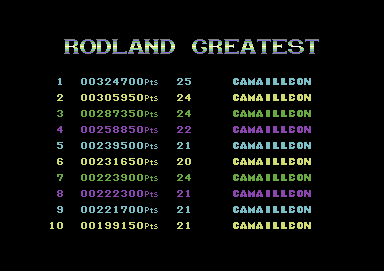 In this version you can enter the highscore and continue the game with the Commodore key as you would expect it. Furthermore it is possible to save the highscore table. Stefan67: Whoever knows and likes Bubble Bobble should essentially try this similarly designed game. This game is one of my favourite games for several reasons. On the one hand because you can play it twosome (simultaneous player) and during the course of the game the second player can enter the game just by pressing the fire button on the joystick. Primarily the animation of the characters but also the sound effects are lovingly designed. The course of the game reminds you somehow of Pacman (picking up flowers and fruits) and also of Lode Runner (the ladders and persecutive creatures). The operation with the joystick is simple and reliable. The bonus and extra levels prevent that boredom is raised quickly. To get an extra life from the elf is always a nice thing to see and hear. Less than 9 out of 10 points for this game is not really fair. TheRyk: Apart from some bugs like an enemy recovering and killing you while beaten up in the bottom right corner, a great game with awesome graphics and really good music. 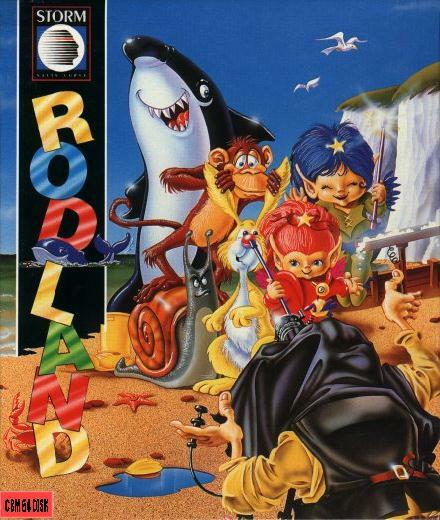 Though it is impossible not to see that Rodland was obviously inspired by Bubble Bobble, there are enough own good ideas. 8 points from me. 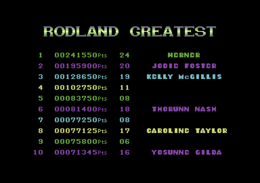 Rodland in the Killer List Of Videogames. The German version of this article on "www.C64-Wiki.de" was "article of the month" in May 2013 and "article of the year" 2013. This page was last modified on 17 March 2018, at 20:12.